Police have seized a truck found in Cleveland they said was used to rob a local school. North Royalton City Schools asked the community for help Tuesday night via social media after more than $12,000 worth of landscaping equipment was stolen from Valley Vista Elementary on Aug. 15. The school's security cameras captured a black pickup truck with a trailer attached, which was used in the crime, according to officials. North Royalton police told newsnet5.com the school's video quality was superior to most surveillance images they receive, but as of last weekend, their department had little to go on in terms of leads as to the truck's owner. 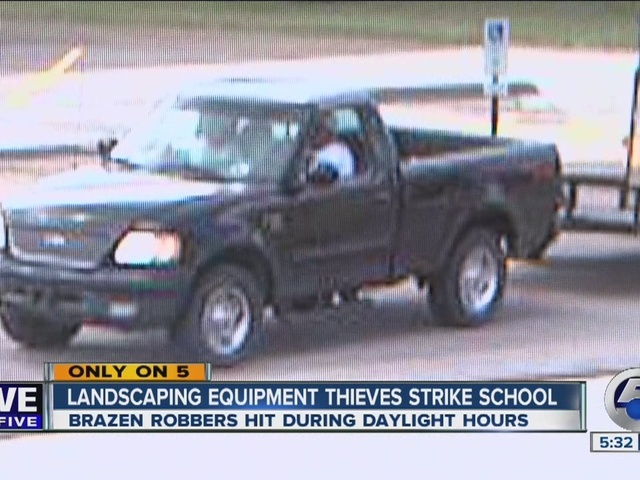 Police said the equipment was stolen from a shed on the school's property in broad daylight. Although police are "certain" the impounded car was involved in the theft, they have not said whether they have recovered any of the stolen equipment. Police told newsnet5.com's Dave Arnold the owner of the truck was also located after they had followed up on a social media tip after the story was released. Detective David Loeding said the case is going through a thorough investigation. "The schools equipment, they use it daily over there. It was a lot of equipment, it's a lot of set back for them. There's a lot to look over and a lot of steps to take," Loeding said. "I hope to bring you better news; that the property is found and we get it back." The missing zero-turn mower is described as a John Deere mowing tractor, green and yellow in color. If you have any information regarding any of the stolen equipment, including huge moose and deer antlers, you are urged to call the North Royalton Police Department at (440) 237-8686.